Jacob’s Cave Suites is an exclusive boutique style cave hotel which is located in the central of Göreme National Park in Çavuşin Old Greek Village. Our hotel was an old house which has very nice architecture. After doing reconstruction we were able to combine the features of the past with the comfort of today. We welcome our lovely guests with 8 original cave rooms on the first floor and 4 stone-arched rooms on the second floor. Hotel has a big garden, our reseption, lobby and restaurant are located in this garden. You can enjoy your organic breakfast or complimentary afternoon tea and homemade cookies with Çavuşin Castle view in our lovely garden. Guests can enjoy to watch hot air balloons with sunrise from our rooftop terrace. Marvel Of Cappadocia ailesi olarak Cappadocia'nın unutulmaz anılarını yaşamazına, Orjinal Kayadan Oyma Mağara odalarımızda Konaklamanıza ve 1960 yapımı olan eski mimarimiz ile hizmetinizdeyiz.. If you are looking for an authentic cave accommodation, The Miracle Cave Hotel will provide the ultimate cave hotel experience in Cappadocia. We are situated in the idyllic and historically rich village of Cavusin, in the heart of Cappadocia. Recently opened in May 2014, it took three years to excavate and transform the Miracle Cave Hotel into an authentic cave hotel entirely hewn by hand. Each of our 8 cave rooms and indoor cave restaurant have been thoughtfully designed with a blend of modern and traditional Turkish aesthetics with your utmost comfort in mind. 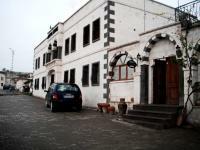 Welcome on the Web page of In pension Our pensionis situated in the picturesque village of Çavuşin, in the center of Cappadocia. For 20 years we have hosted walkers and nature’s lover. Our pension is in a quiet place and our customers are mainly french-speaking. We also receive lots of families because this place is very nice, agreable and secure for children. Çavuşin is the right place to go for a walk as it the beginning of several valleys. Beside, there is no need to take the car as you can easily reach those valleys by walk. İn this friendly atmosphere, you will find also the peace of a village which is apart from big tourism. We have 17 rooms, of which 10 are equiped with a bathroom, and 3 are vaulted. There is also an “oriental” living room and an iner courtyard, as well as a shaded terace. We organize excursions and day-trip. We also furnish walking maps. Cappadocia’s footpath have no more secret for us.